Item Number: 166-6-34 18717 Actual Weight: 11 lbs. 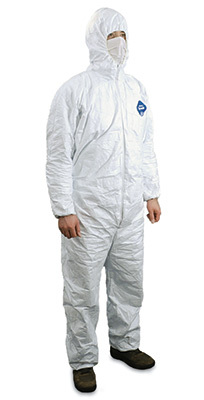 Protective and durable coveralls are made of Tyvek material so it can’t be worn away. Comfort fit design for better fit and improved mobility. Provides protection against hazardous dry particles and aerosols, and non-hazardous light liquid splash. Can be used in general maintenance, operations, asbestos and lead abatement, mold remediation and environmental cleanups. Coveralls have a zipper closure, elastic waist, wrist, and ankles in addition to an attached hood. Mask sold separately.